ALPhA, the Advanced Laboratory Physics Association, held its 2012 Topical Conference on Laboratory Instruction: Beyond the First Year (BFY) of College at the University of Pennsylvania and Drexel University, Wednesday, July 25 - Friday, July 27, 2012, immediately preceding the 2012 AAPT Summer Meeting. Download materials from the conference workshops and presentations by following this link. Click on the title of the event to see the abstract and download the materials. 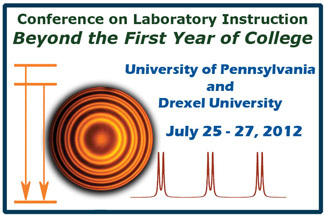 This conference offered an unusual and excellent opportunity for hands-on exposure to a broad selection of contemporary instructional labs appropriate to Modern Physics, Electronics, Optics, and Advanced Lab courses, as well as to key instructional labs in Statistical Physics, Condensed Matter and Materials Physics, Quantum Mechanics, etc. Conference participants shared their laboratory expertise and materials in a variety of venues, including specific laboratory topics and curricular models that are effective at different types of institutions. Commercial vendors of advanced laboratory equipment presented working demonstrations of their products.